Starlight cruise is the newest luxury cruise ship to operate on the bay, which was inaugurated in April 2013. As it is a new ship, all amenities onboard employ the state of the art, including private Jacuzzi, mini golf, and spacious bar and restaurant. Starlight has a capacity of 64 passengers, which makes it an ideal choice for family, school groups and company trip. The cruise will start sailing on a daily basis in late September, as confirmed by its mother company - Oriental Sails. “We have had an exciting four months of trial running and all feedbacks have been overwhelmingly positive. After several years in business with the deluxe cruise Calypso and the budget line Oriental Sails, Starlight is really the fruit of our experience, innovation, dedication and love for Halong Bay.“ speaks an Oriental Sails sales executive with much enthusiasm. The cruise cabins are luxuriously equipped with standard of a 5 star hotel on land, but what makes the cruise different is its enormous cabin size: 22m2 for deluxe cabin and 50m2 for suite cabin, which is the largest of its kind in Halong Bay. The spacious cabins mean a lot more comfortable stay compared with the traditional wooden junks’ tiny rooms. “Starlight Cruise is appealing from its very first look. However, one has to stay overnight on board and take its trip to fully appreciate its level of luxury. We have already received many booking requests for this cruise in the months of October and November”, shares Ms. Hannah Pham – Sales Manager at Cruise Halong Bay, a leading cruise reseller for Oriental Sails. 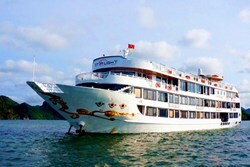 One can reserve his or her space on Starlight Cruise either by contacting the cruise directly (http://www.starlightcruises.vn) or through its official reseller Cruise Halong Bay (http://www.cruisehalongbay.com). Price for a two-day trip with food and boarding included starts from $225 per person.